KANSAS CITY, Mo. - An ingenious chimpanzee fashioned a ladder out of a tree limb to break out of an enclosure at the Kansas City Zoo on Thursday afternoon - and then convinced six other chimps to bolt with her, zoo officials said. The great escape began about 4 p.m. after the ringleader was able to break a roughly 6-foot limb from a tree and use it to climb to the top of the outdoor enclosure wall, zoo spokeswoman Julie Neemeyer. "That chimp then enticed six other chimps to join the first chimp," Neemeyer said. 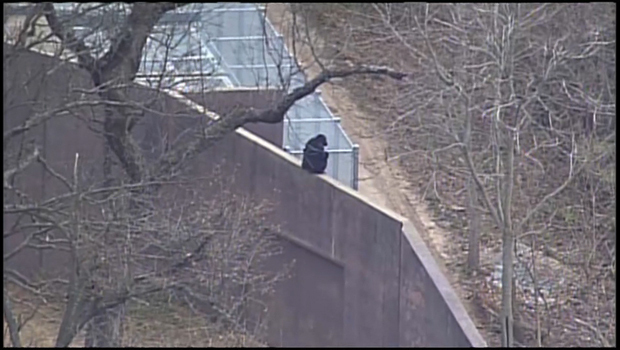 The chimpanzees never left the immediate area of the zoo's Africa section and they were quickly surrounded by zoo staff in enclosed vehicles, Neemeyer said. Visitors to the Africa section, meanwhile, were held inside various zoo buildings to keep them safe, she said. Within about 1 1/2 hours all of the chimpanzees had been lured back into their holding building, she said. The chimps succumbed to offerings of food -- carrots, celery, lettuce and especially, Milk-Bone dog biscuits, she said. The zoo isn't taking any chances of another breakout. On Friday, the chimpanzee exhibit will be closed while staff check for any additional tree limbs that could cause problems.